With their painted red cheeks, their black-lined eyes, and big red nose, clowns are some of the creepiest things in existence. And what of Chucky and his beloved bride, or Annabelle on her rocking chair. But what makes them so? What is it about clowns, or dolls, or even androids that make people squirm? Coined in the ’70s, the term describes the revulsion humans have for things that are human-like, but not quite human. One theory states that we avoid anything that doesn’t look “right” or “healthy” because it could mean disease. In other words, “pathogen avoidance.” Just like we can be freaked out by people with major physical deformities, because those deformities could be the result of say, fungi or flesh-eating parasites, we tend to be freaked out by human-like things that don’t seem right to us. We’re just trying to protect ourselves; it’s all evolution, baby. There’s a graph that describes where the uncanny valley lives. It doesn’t hit until you start getting into the realms of puppets and prostheses, and, of course, zombies. Because, zombies. We especially don’t like weird human-like things moving, because movement is supposed to be linked to life, and these things shouldn’t be alive, at least to our pathogen-fearing brains. Stuffed animals, which tend to be unmoving, don’t unnerve us. Industrial robots, which aren’t really that human-like, don’t freak us out, either. But give us a good brain-loving zombie, and that’s it. We’re done. Our brains don’t like it. I personally think she’s kinda cute, except for the teeth. Even with the theories abounding, scientists don’t exactly know why the uncanny valley exists. There’s definitely a general consensus, though, that human-like behavior, or trying to mimic human behavior, causes the repulsion in real humans. If, say, an android is jerky or doesn’t hold good eye contact, it causes a disconnect in people’s brains between what they think the motion or behavior should look like, and how it actually looks. What’s interesting is that anyone–even if they live in some remote tribe in Cambodia–can experience the uncanny valley. BUT, it typically only when researchers show people humanoid faces similar to the viewers’ own ethnic group. 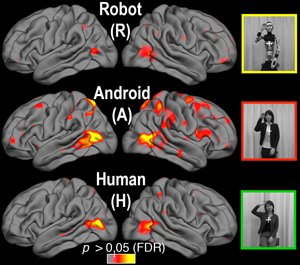 A team of researchers, led by Ayse Pinar Saygin at the University of California, San Diego, ran a bunch of fMRI studies of people watching android videos, compared to robot-like robots or just plain old humans. The fMRI study does indicate that part of the uncanny valley disconnect is that our brains are having trouble matching up perception and motion. What’s being called the “action perception system”, the human brain is aware of human motions and appearances. Subjects aged 20-36 who had no experience working with robots, and who haven’t spent much time in Japan where robots and androids are more accepted, were shown a bunch of videos of an actroid (yes, it’s a word: actress + android) doing normal, everyday, human things, like drinking water, picking something up from a table, or waving at people. These subjects were also shown videos of those actions performed by a human that the actroid was based on. And then shown yet another video of the android stripped of its skin, so that only the metal and wires and such were showing. Scanned using fMRI, the major difference found in the brain’s responses to each condition occurred in the parietal cortex , especially with regards to the areas that connect to the visual cortex. In particular, the connections were to visual cortex areas dedicated to processing body movement, along with part of the motor cortex that contains mirror neurons (those monkey-see, monkey-do neurons that relate to empathy). There’s evidence of some sort of mismatch happening. When the android was shown, its weird robot-movement wasn’t quite processed by the subjects’ brains. This makes some sense, since there’s no evolutionary need for a human brain to care about bio-like appearances or biological motion. What the brain is looking for, however, is a match between appearance and motion. Dogs should walk like dogs, jaguars should run like jaguars, humans should walk like humans, and androids..well, they just move weirdly. They look like people, but don’t move like us. So our brains can’t process that, and we feel repulsed. We wouldn’t be repulsed, however, if an android moved just like a human–our brains can process that, since what we’re seeing (a human-like body) is coupled with human-congruent motion. Today’s other experiments are trying to figure out where there’s a disconnect in human perception and humanoid figures, like AI robots. There’s a lot of research also happening about empathy and human emotional response during an interaction with, e.g. androids. What if our society grows to include androids in daily interactions. Would their not-quite-human behavior and look prevent humans from establishing an emotional connection with these figures. Would it matter, if androids don’t have minds or emotions, anyway. But what if they end up being a lot more emotionally and intellectually aware than we think they are; could this cause a societal issue if humans view androids as lesser beings unworthy of empathy or respect?